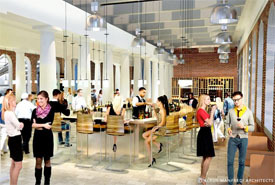 Faneuil Hall is looking to make some changes. A 180 room hotel, freshened up food court and a shake up of existing tenants. The updates to Quincy Market, which include the new retailers, the hotel and more developments, are all part of Ashkenazy’s plan to make Faneuil Hall more attractive to those living in Boston…we also learned that Faneuil’s notorious brick walkways could be repaved with smooth granite, with benches replaced by movable chairs, drastically changing the marketplace’s familiar and historical facade – but making it easier to walk, especially for those in heels. Past coverage of the impending changes in Faneuil Hall have filtered in from both the Boston Globe(in September) and the New York Times (in early December). While today’s City Council meeting was held in regards to the impact on pushcart vendors in Faneuil Hall, the conversation focused on the many alterations slated for the marketplace. The redevelopment is in its early stages, and some of the proposed changes would require the BRA’s Article 80 review.